When my wife and I recently walked by The Pen Shop in Manchester’s Trafford Centre we saw an ink blotter in the window. Since it was nice looking and the price was reduced we bought it. My wife will be using it in her office, but the ink blotter brought an old topic up again: Where to get suitable blotting paper from? I noticed in the past that many shops sell ink blotters, but they do not sell blotting paper. The good thing is that you can buy generic blotting paper and cut it to the correct size. 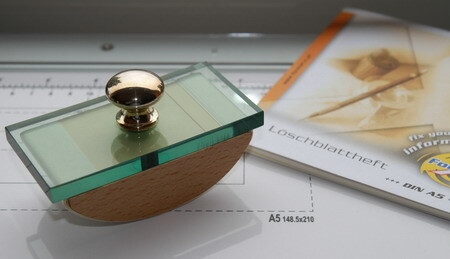 If you buy exercise books in the German speaking countries they tend to come with a sheet of blotting paper, because in many areas pupils have to write with fountain pens. Finding blotting paper is however more difficult, as there does not seem to be much choice. Blotting paper is said to have been invented by accident at Lyng Mill in Norfolk, England. There are however different theories about when blotting paper was first used and about its origins (it probably was not invented at Lyng Mill). Blotting paper was very common in the past, when dip pens and fountain pens were more popular and before the invention of blotting paper people used blotting sand. For my wife’s ink blotter I cut A5 blotting paper to size. The paper I used was made in Austria, produced by Format Werk, Austria’s largest producer of stationery for schools and offices. Their history seems to start in 1968 when their trademark was registered. The Format Werk factory was established in 1976 and in 1997 Herlitz, I mentioned them in an earlier post, bought Format Werk. In 2001 Format Werk became Austrian again, after a management buyout. The Format Werk blotting paper is carbon neutral and has a pleasant beige colour. It is suitable for blotting, but I have to say that I have seen better blotting paper. The blotting paper (unknown brand) that came with my beechwood ink blotter does not cause feathering. The Format Werk blotting paper sometimes does cause some feathering, presumably because it does not absorb the ink fast enough and is therefore squeezing the ink onto the writing paper. Unless you use a very wet ink and writing paper that does not absorb the ink well this should however not be a problem. A good blotting paper, but it could be better. It is not expensive and, commendable, it is carbon neutral.